HelluvaCook.com! : Big Badass Barbeque Deep Fryer! Who has the baddest deep fryer in Oakland Co. Mi?? So, Byrnes & I finally bit the bullet and bought ourselves a pro-grade 8.5 gallon deep fryer! We knew that the upcoming Polish Festival (click for map!) at Our Lady of Czestochowa Church on June 2nd & 3rd at which we intend to sell meatballs and french fries (among other things) to the parishioners! Somehow, I managed to convince my brotherfromanothermother to go in halves w/ me on the biggest, baddest deep fryer that we could reasonably afford! As a result, we ended up buying the 8.5 gallon deep fryer by R & V Works (click to visit their website!) made right here in the good ol' USA!!! In fact, when doing the research on which fryer to purchase, I went so far as to call the manufacturer to ask some general questions about their fryer units to see what they had to say and I was thoroughly impressed! The lady on the other end of the line had the sweetest southern accent (might have had something to do with the fact that they are based in Louisiana -- click for map!) and was more than willing to answer all of the silly questions that came to mind during our 15 minute conversation. By the time I'd gotten off of the phone, I knew that this was the company from which to purchase the deep fryer, so the only thing left to do was determine which model best suited our needs. As it turns out, she recommended that I get the unit directly from Bass Pro Shop -- click for item listing! because they themselves were back-ordered on almost all models by several weeks. This worked out well because the local Bass Pro Shop store actually had 3 of this particular model in stock and available for immediate pickup! Furthermore, they matched the price on their own website, which ended up saving us $130 off of the original MSRP of $630.00! This means that I was able to get out the door for $530 after sales tax, which truly was an unbeatable deal because we avoided having to pay any sort of shipping fee (which would have been approx $100) by picking it up directly from the store! Click on any image for a larger version! I was so excited to play with my new toy that I didn't bother waiting for any help from anyone to get it all put together! Though I had invited both Byrnes and The Neighbs, neither had been available at the time, so set out to get it done myself! The assembly of the unit was easy and went fairly quickly, though I spent a little extra time taking a picture of each step in the process for the sake of posterity. I may also offer these pics to R & V Works as a thank you for building such an awesome product so that they can post them on their site for others to use as a guide when putting together their own new units! This thing can cook 20 lbs of chicken wings at once!! We can't wait to test drive this big bad mamma-jamma!! We're considering hauling it on down to Parma, Ohio for Unc's annual Memorial Weekend Seafood Boil -- map!, though the final verdict still remains yet to be determined. Byrnes and I certainly intend to fire this sucker up on Sunday evening (May 27th) upon our return to the Hills of Rochester! We welcome all of the usual suspects to come on out for some suds and some deep-fried spuds during the evening and late into the night! Monday is Memorial Day, so let's do some grillin' and chillin' on Sunday night! Shoot me a note if you're interested in swinging by! 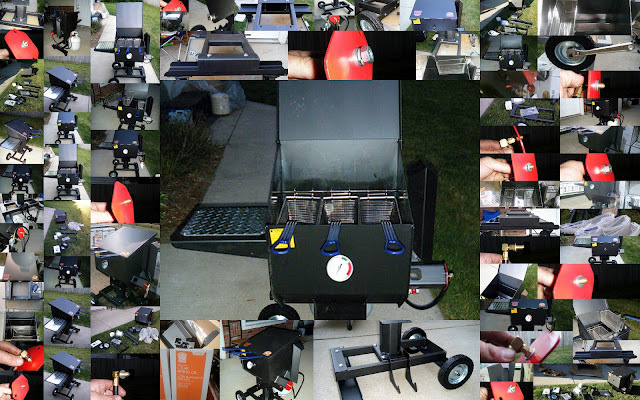 Click here to see the entire photo gallery of the 8.5 gallon deep fryer being constructed! !